I was born in Yekaterinburg in 1990, graduated from music school in piano in 2003, but then stopped playing music - instead I wanted to work in the IT sphere. In 2006 things took a different direction when one of my friends showed me a couple simple chords on an old russian acoustic guitar, which by the way sounded totally out of tune! My progress was pretty good and within a year of playing acoustic and electric guitar I realized, that I wanted to pursue a professional career. In 2007 I went to study at the Ural P.I.Tchaikovsky Music College and began to work as studio and hired musician. 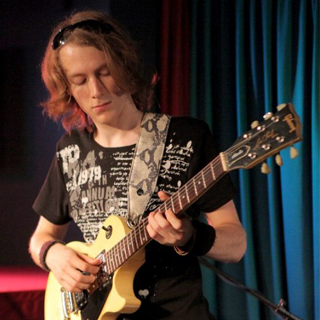 In 2008 I started to give private guitar lessons in my city. For the present moment I play in two bands, one of them is jazz\funk with a female vocalist and the other is a soul\hip-hop with some jazz influences. I also do producer jobs for bands on request. Right now I'm using my incredible Suhr Standard Custom guitar, which I was waiting for about one year. This guitar strongly pushed my playing forward and in the beginning of 2012 I've won several russian online competitions and took 6th place in The French Guitar Contest. Also I have Gibson Les Paul Studio'84, which is great guitar too. My sound comes from the Axe FX Standard, which is complex but great sounding piece of gear. I also have a bunch of pedals (Strymon, Cmatmods, Xotic production among them). I love listening to metal. My first guitar influences were Children of Bodom and various death metal bands. I still consider Chuck Schuldiner to be the most soulful metal musician for me. Later on I moved to more complex metal styles: progressive, math etc. As I was evolving as a musician, I started to listening to music of almost all genres: pop, swing, funk, contemporary jazz, fusion, IDM, dupstep - it all appeals to me equally. This allows me to get inspired by a huge variety of styles, from Rihanna to Born of Osiris, from Christian Scott to Matta. I'm looking forward to communicate and share my experience with GMC:ers all around the world, to help young players to become guitar heroes but also to improve my own skills as a guitar instructor!